The Assistant Director for Policy and Defense Relation, Colonel Nick Slinger, led the British defence ministry team. He participated in the talks held Thursday evening around 5 p.m. with consortium representatives at the consortium's office, which is located along the Nallur Kovil Road. 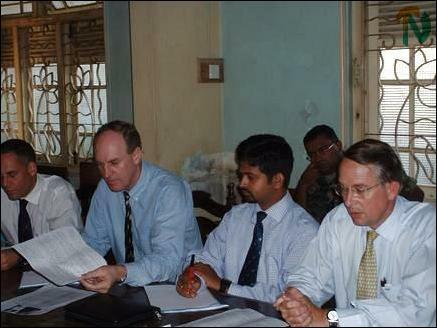 Mr. Slinger was accompanied two defence official of the British embassy in Colombo, Messrs J.Farrow and Mark Wildon. On behalf of the Jaffna consortium, Fr.J.Jeyakumar, Mr.M.K.Eelaventhan and Mr.C.V.K.Sivagnanam participated in the discussion. 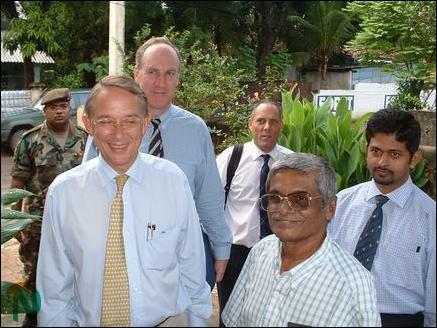 British defense team head, Colonel Nick Slinger, with his Colombo officials being received by Jaffna NGOs Consortium officials at the the consortium's office. The British team officials said that they had come to Jaffna to obtain first hand information regarding the ground situation prevailing in Jaffna in the spheres of economy and political development, sources said. Thousands of internally displaced families have been languishing in refugee camps and welfare centres unable to return to their houses and lands, which are located in the high security zones, consortium representatives told the British team. The consortium representatives brought to the notice of the British team that of the money allocated for the development of Jaffna district upto now since the signing of the Memorandum of Understanding between the government and LTTE, only about forty percent had been spent on development purposes and the balance had been utilized for administrative and other purposes, sources said. The Consortium delegation told the visiting officials that the British government should come forward to exert pressure on the Sri Lankan government to hand over an interim administrative structure for the northeast province with adequate powers to the LTTE to create a conducive situation to take forward the peace process to find a final political solution to the national conflict, sources said. The NGO representatives said only a small percentage of people in the south have been opposing the peace process and that a majority of Tamil and Sinhala people have been working for the success of the peace process. The British defense team on its arrival at the Palaly main army base held wide-ranging discussions with top officials of the Sri Lanka Army, sources said.